Each Friday I’ll serve up a photo and give you the story behind it. This week, latrine covers in waiting. Improving sanitation by building latrines is an important and necessary task in developing countries. However, this particular project illustrates some of the standard problems in development work. 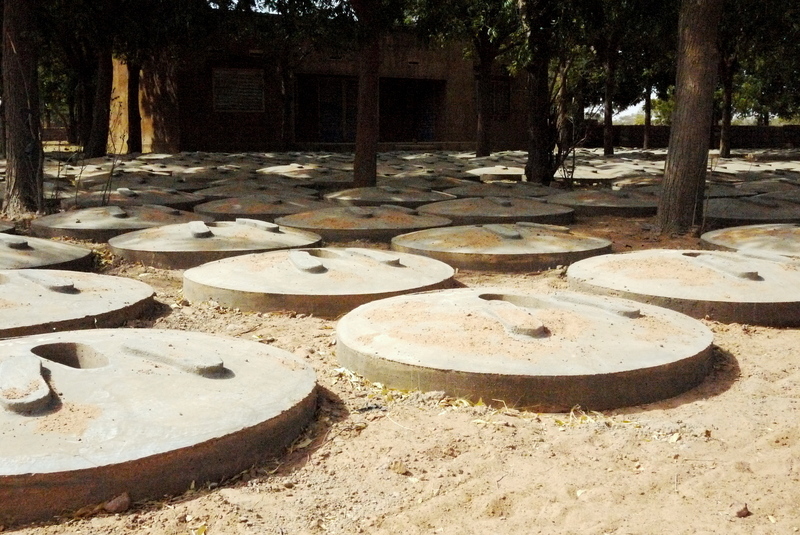 Hundreds of latrine covers were made, but have not been used. Instead, for whatever reason implementation has been delayed and they have been sitting in this courtyard for months. For more on why sanitation is so important, here are a few reasons from Robert Chambers. …[S]anitation and hygiene matter much more than most people realise. Where they lack, the effects are horrendous. Faecally-related infections are many. Everyone has heard of the diarrhoeas and feels outrage at over 2 million children killed by diarrhoea each year. We hear about cholera outbreaks. But who hears about the guts of 1.5 billion people hosting greedy parasitic ascaris worms, about 740 million with hookworm voraciously devouring their blood, 200 million with debilitating schistosomiasis or 40 to 70 million with liverfluke? And what about hepatitis, giardia, tapeworms, typhoid, polio, trachoma…?